Grails' command line system is built on Gant - a simple Groovy wrapper around Apache Ant. When Grails executes a Gant script, it invokes the "default" target defined in that script. If there is no default, Grails will quit with an error. When you run a script manually and it prompts you for information, you can answer the questions and continue running the script. But when you run a script as part of an automated process, for example a continuous integration build server, there's no way to "answer" the questions. So you can pass the --non-interactive switch to the script command to tell Grails to accept the default answer for any questions, for example whether to install a missing plugin. The stop-app command will stop an application that has been run with the run-app command. To exit interactive mode enter the exit command. Note that if the Grails application has been run with run-app normally it will terminate when the interactive mode console exits because the JVM will be terminated. An exception to this would be if the application were running in forked mode which means the application is running in a different JVM. In that case the application will be left running afer the interactive mode console terminates. If you want to exit interactive mode and stop an application that is running in forked mode, use the quit command. The quit command will stop the running application and then close interactive mode. Since Grails 2.3, the run-app, run-war, test-app and console commands are now executed in a forked JVM in order to isolate the build classpath from the runtime classpath. The memory requirements of the forked JVM can be tweaked as per the requirements of the application. Since forked execution isolates classpaths more effectively than embedded execution you can deploy additional WAR files (such as other Grails or Spring applications) to the container. The easiest way to do so is to drop the WAR files into the src/autodeploy directory (if it doesn't exist you can create it). As demonstrated in the script above, there is an implicit ant variable (an instance of groovy.util.AntBuilder) that allows access to the Apache Ant API. In previous versions of Grails (1.0.3 and below), the variable was Ant, i.e. with a capital first letter. You can also "depend" on other targets using the depends method demonstrated in the default target above. This lets you call the default target directly from other scripts if you wish. Also, although we have put the call to setDefaultTarget() at the end of the script in this example, it can go anywhere as long as it comes after the target it refers to ("clean-compile" in this case). Which approach is better? To be honest, you can use whichever you prefer - there don't seem to be any major advantages in either case. One thing we would say is that if you want to allow other scripts to call your "default" target, you should move it into a shared script that doesn't have a default target at all. We'll talk some more about this in the next section. 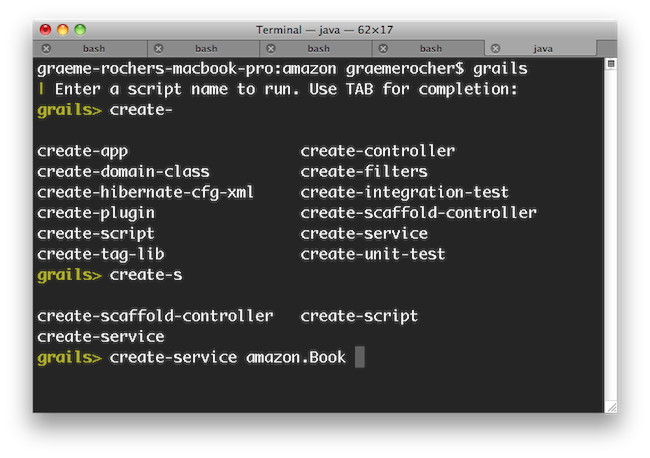 Grails ships with a lot of command line functionality out of the box that you may find useful in your own scripts (See the command line reference in the reference guide for info on all the commands). Of particular use are the compile, package and bootstrap scripts. Don't worry too much about the syntax using a class, it's quite specialised. If you're interested, look into the Gant documentation. As you saw in the example at the beginning of this section, you use neither the File- nor the class-based syntax for includeTargets when including core Grails targets. Instead, you should use the special grailsScript() method that is provided by the Grails command launcher (note that this is not available in normal Gant scripts, just Grails ones). _GrailsSettings You really should include this! Fortunately, it is included automatically by all other Grails scripts except _GrailsProxy, so you usually don't have to include it explicitly. _GrailsEvents Include this to fire events. Adds an event(String eventName, List args) method. Again, included by almost all other Grails scripts. _GrailsClasspath Configures compilation, test, and runtime classpaths. If you want to use or play with them, include this script. Again, included by almost all other Grails scripts. _GrailsProxy If you don't have direct access to the internet and use a proxy, include this script to configure access through your proxy. _GrailsArgParsing Provides a parseArguments target that does what it says on the tin: parses the arguments provided by the user when they run your script. Adds them to the argsMap property. _GrailsTest Contains all the shared test code. Useful if you want to add any extra tests. _GrailsRun Provides all you need to run the application in the configured servlet container, either normally (runApp/runAppHttps) or from a WAR file (runWar/runWarHttps). There are many more scripts provided by Grails, so it is worth digging into the scripts themselves to find out what kind of targets are available. Anything that starts with an "_" is designed for reuse. You maybe wondering what those underscores are doing in the names of the Grails scripts. That is Grails' way of determining that a script is _internal , or in other words that it has not corresponding "command". So you can't run "grails _grails-settings" for example. That is also why they don't have a default target. Split scripts into a "command" script and an internal one. Put the bulk of the implementation in the internal script. Put argument parsing into the "command" script. To pass arguments to a target, create some script variables and initialise them before calling the target. Avoid name clashes by using closures assigned to script variables instead of targets. You can then pass arguments direct to the closures. Grails provides the ability to hook into scripting events. These are events triggered during execution of Grails target and plugin scripts. The mechanism is deliberately simple and loosely specified. The list of possible events is not fixed in any way, so it is possible to hook into events triggered by plugin scripts, for which there is no equivalent event in the core target scripts. Whenever an event is fired, all the registered handlers for that event are executed. Note that the registration of handlers is performed automatically by Grails, so you just need to declare them in the relevant _Events.groovy file. SetClasspath rootLoader Called during classpath initialization so plugins can augment the classpath with rootLoader.addURL(...). Note that this augments the classpath after event scripts are loaded so you cannot use this to load a class that your event script needs to import, although you can do this if you load the class by name. Grails is most definitely an opinionated framework and it prefers convention to configuration, but this doesn't mean you can't configure it. In this section, we look at how you can influence and modify the standard Grails build. The core of the Grails build configuration is the grails.util.BuildSettings class, which contains quite a bit of useful information. It controls where classes are compiled to, what dependencies the application has, and other such settings. baseDir The location of the project. userHome The user's home directory. grailsHome The location of the Grails installation in use (may be null). grailsVersion The version of Grails being used by the project. grailsEnv The current Grails environment. config The configuration settings defined in the project's BuildConfig.groovy file. Access properties in the same way as you access runtime settings: grailsSettings.config.foo.bar.hello. compileDependencies A list of compile-time project dependencies as File instances. testDependencies A list of test-time project dependencies as File instances. runtimeDependencies A list of runtime-time project dependencies as File instances. Of course, these properties aren't much good if you can't get hold of them. Fortunately that's easy to do: an instance of BuildSettings is available to your scripts as the grailsSettings script variable. 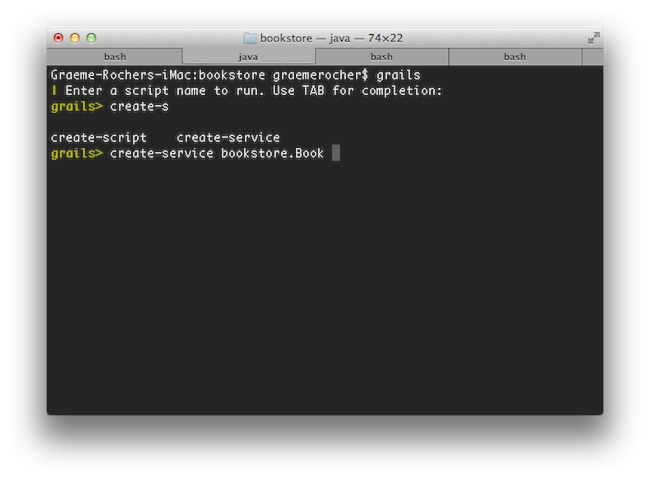 You can also access it from your code by using the grails.util.BuildSettingsHolder class, but this isn't recommended. Note that the default values take account of the property values they depend on, so setting the project working directory like this would also relocate the compiled classes, test classes, resources, and plugins. What happens if you use both a system property and a configuration option? Then the system property wins because it takes precedence over the BuildConfig.groovy file, which in turn takes precedence over the default values. The BuildConfig.groovy file is a sibling of grails-app/conf/Config.groovy - the former contains options that only affect the build, whereas the latter contains those that affect the application at runtime. It's not limited to the options in the first table either: you will find build configuration options dotted around the documentation, such as ones for specifying the port that the embedded servlet container runs on or for determining what files get packaged in the WAR file. grails.server.port.http Port to run the embedded servlet container on ("run-app" and "run-war"). Integer. grails.server.port.https Port to run the embedded servlet container on for HTTPS ("run-app --https" and "run-war --https"). Integer. grails.config.base.webXml Path to a custom web.xml file to use for the application (alternative to using the web.xml template). grails.compiler.dependencies Legacy approach to adding extra dependencies to the compiler classpath. Set it to a closure containing "fileset()" entries. These entries will be processed by an AntBuilder so the syntax is the Groovy form of the corresponding XML elements in an Ant build file, e.g. fileset(dir: "$basedir/lib", includes: "**/*.class"). grails.testing.patterns A list of Ant path patterns that let you control which files are included in the tests. The patterns should not include the test case suffix, which is set by the next property. grails.testing.nameSuffix By default, tests are assumed to have a suffix of "Tests". You can change it to anything you like but setting this option. For example, another common suffix is "Test". grails.project.war.file A string containing the file path of the generated WAR file, along with its full name (include extension). For example, "target/my-app.war". grails.war.dependencies A closure containing "fileset()" entries that allows you complete control over what goes in the WAR's "WEB-INF/lib" directory. grails.war.copyToWebApp A closure containing "fileset()" entries that allows you complete control over what goes in the root of the WAR. It overrides the default behaviour of including everything under "web-app". grails.war.resources A closure that takes the location of the staging directory as its first argument. You can use any Ant tasks to do anything you like. It is typically used to remove files from the staging directory before that directory is jar'd up into a WAR. Grails uses an agent based reloading system in the development environment that allows source code changes to be picked up while the application is running. This reloading agent caches information needed to carry out the reloading efficiently. By default this information is stored under <USER_HOME_DIR>/.grails/.slcache/. The GRAILS_AGENT_CACHE_DIR environment variable may be assigned a value to cause this cache information to be stored somewhere else. Note that this is an operating system environment variable, not a JVM system property or a property which may be defined in BuildConfig.groovy. This setting must be defined as an environment variable because the agent cache directory must be configured very early in the JVM startup process, before any Grails code is executed. If all the other projects in your team or company are built using a standard build tool such as Ant or Maven, you become the black sheep of the family when you use the Grails command line to build your application. Fortunately, you can easily integrate the Grails build system into the main build tools in use today (well, the ones in use in Java projects at least). run - Equivalent to "grails run-app"
The build file is configured to use Apache Ivy for dependency management, which means that it will automatically download all the requisite Grails JAR files and other dependencies on demand. You don't even have to install Grails locally to use it! That makes it particularly useful for continuous integration systems such as CruiseControl or Jenkins. home The location of the Grails installation directory to use for the build. Yes, unless classpath is specified. classpathref Classpath to load Grails from. Must include the "grails-bootstrap" artifact and should include "grails-scripts". Yes, unless home is set or you use a classpath element. script The name of the Grails script to run, e.g. "TestApp". Yes. args The arguments to pass to the script, e.g. "-unit -xml". No. Defaults to "". environment The Grails environment to run the script in. No. Defaults to the script default. includeRuntimeClasspath Advanced setting: adds the application's runtime classpath to the build classpath if true. No. Defaults to true. classpath - The build classpath (used to load Gant and the Grails scripts). compileClasspath - Classpath used to compile the application's classes. runtimeClasspath - Classpath used to run the application and package the WAR. Typically includes everything in @compileClasspath. testClasspath - Classpath used to compile and run the tests. Typically includes everything in runtimeClasspath. How you populate these paths is up to you. If you use the home attribute and put your own dependencies in the lib directory, then you don't even need to use any of them. For an example of their use, take a look at the generated Ant build file for new apps. Grails provides integration with Maven 2 with a Maven plugin. In order to use the Maven plugin, all you need is Maven 2 installed and set up. This is because you no longer need to install Grails separately to use it with Maven! The Maven 2 integration for Grails has been designed and tested for Maven 2.0.9 and above. It will not work with earlier versions. The create-pom command expects a group id as an argument. The name and the version are taken from the application.properties of the application. The Maven plugin will keep the version in the pom.xml in sync with the version in application.properties. package - Builds a WAR file from the Grails project. Other standard Maven commands will likely work too. Choose whichever grails version, group ID and artifact ID you want for your application, but everything else must be as written. This will create a new Maven project with a POM and a couple of other files. What you won't see is anything that looks like a Grails application. So, the next step is to create the project structure that you're used to. Note that the type element must be set to zip. By default the Maven plugin will run Grails commands in-process, meaning that the Grails process occupies the same JVM as the Maven process. This can put strain on the Maven process for particularly large applications. By reading the pom.xml file you can do an initial mvn install from the parent project to build all plugins and install them into your local maven cache and then cd into your project and use the regular grails run-app command to run your application. All previously built plugins will be resolved from the local Maven cache. The standard POM created for you by Grails already attaches the appropriate core Grails commands to their corresponding build phases, so "compile" goes in the "compile" phase and "war" goes in the "package" phase. That doesn't help though when you want to attach a plugin's command to a particular phase. The classic example is functional tests. How do you make sure that your functional tests (using which ever plugin you have decided on) are run during the "integration-test" phase? The process will be suspended on startup and listening for a debugger on port 8000. If you come across any problems with the Maven integration, please raise a JIRA issue. The Grails Wrapper allows a Grails application to built without having to install Grails and configure a GRAILS_HOME environment variable. The wrapper includes a small shell script and a couple of small bootstrap jar files that typically would be checked in to source code control along with the rest of the project. The first time the wrapper is executed it will download and configure a Grails installation. This wrapper makes it more simple to setup a development environment, configure CI and manage upgrades to future versions of Grails. When the application is upgraded to the next version of Grails, the wrapper is updated and checked in to the source code control system and the next time developers update their workspace and run the wrapper, they will automatically be using the correct version of Grails. 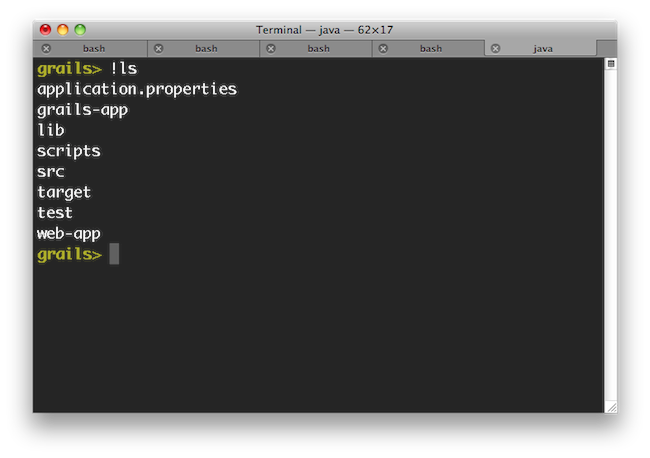 The wrapper command can be used to generate the wrapper shell scripts and supporting jar files. 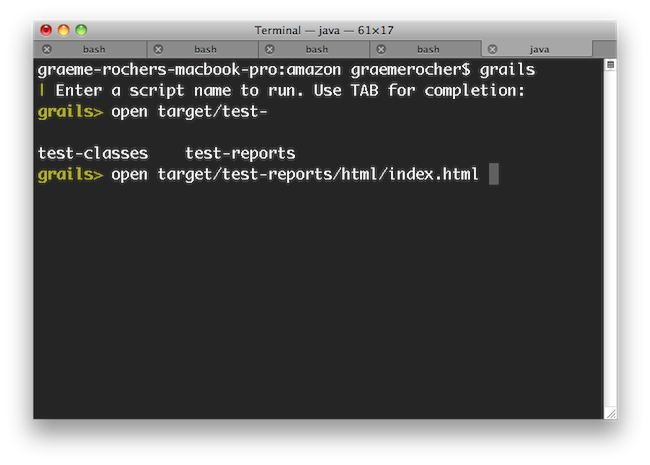 Execute the wrapper command at the top of an existing Grails project. In order to do this of course Grails must be installed and configured. This is only a requirement for bootstrapping the wrapper. Once the wrapper is generated there is no need to have a Grails installation configured in order to use the wrapper. See the wrapper command documentation for details about command line arguments. By default the wrapper command will generate a grailsw shell script and grailsw.bat batch file at the top of the project. In addition to those, a wrapper/ directory (the name of the directory is configurable via command line options) is generated which contains some support files which are necessary to run the wrapper. All of these files should be checked into the source code control system along with the rest of the project. This allows developers to check the project out of source code control and immediately start using the wrapper to execute Grails commands without having to install and configure Grails. The wrapper script accepts all of the same arguments as the normal grails command.